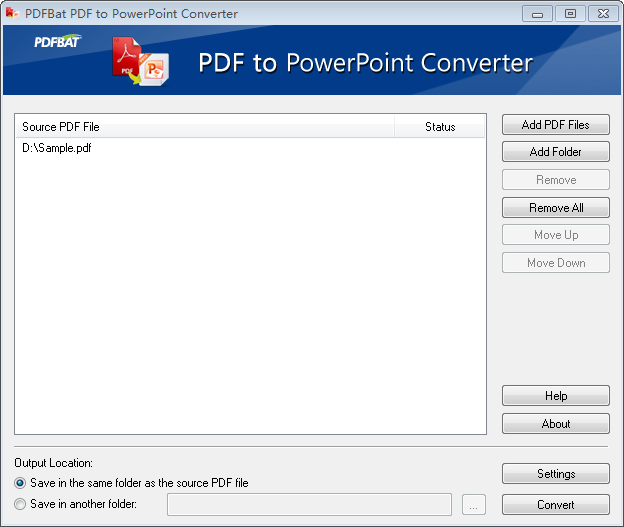 PDFBat PDF to PowerPoint Converter 9.8 Free Download - fast convert pdf to powerpoint (pdf to ppt) with outstanding quality. convert encrypted pdf files: support directly converting restricted pdf files. if the imported pdf has user/open password, you should enter the password to start conversion. good preservation: preserve original layout of text, columns, tables, graphics and even hyperlinks of pdf files to powerpoint presentations. there's no need to retype or reformat the converted presentations. batch conversion - convert unlimited pdf files at one time. partial conversion - type in specific pages to convert the pages as you need. separate page numbers with commas, enter page ranges, or do a combination (example: 1, 3, 5-12). add headers, footers, watermarks, shapes, etc. : to make a good ppt presentation, you can add headers, footers, watermarks, shapes, images, etc. in the generated ppt presentation. add animations to make dynamic: you can flexibly add animations to the generated ppt presentations, so preparing for a successful lecture or speech presentation is just a piece of cake. intuitive and user-friendly interface: the intuitive and user-friendly interface can helps beginners easily and rapidly convert pdf to ppt format without any assistant tools. the whole process of conversion can be finished just in a few clicks. no required adobe acrobat or adobe reader: it's extremely easy to make professional powerpoint presentations from pdf files, without adobe acrobat or adobe reader required. a professional pdf to excel converter, can fast and precisely convert pdf to xls. fast and easily convert pdf to word (pdf to doc) with high quality..
fast convert pdf to powerpoint (pdf to ppt) with outstanding quality..